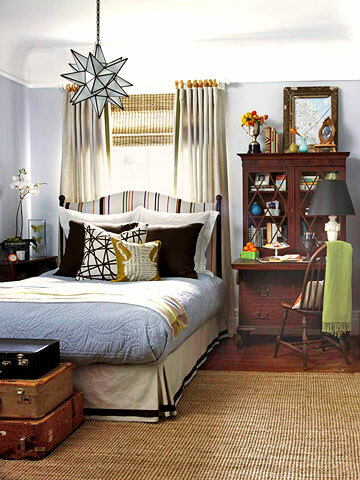 I really love this bedroom that, with a couple of changes, would be the perfect bedroom for a young man. I'm working on a guest bedroom and we are using both a secretary and a Moravian star pendant and I think the result is going to be fabulous. This is one of those rooms where I can't pinpoint one exact thing that I love...it just all works together so well. Although I can pinpoint the suitcases, which I don't like. I'm so happy it's Friday! Have a terrific weekend...see you Monday! love moravian stars - how would you feel about that with 8 Ft ceilings?